#2 Fernandes VH-3 bridge pickup. Got an RSG that's missing one, would like the complete set for originality's sake. Doesn't need to have screws, springs or cover, but must work without issues and have proper lenght lead. #3 Burny long Maestro vibrola/tremolo cover, nickel or chrome. I'd need just the cover, but the whole tremolo unit would suffice as well in a pinch, not holding my breath for this one in either case. Shoot me a PM with pictures and asking price if you got the merch. Holy hell, half forgot I had this one up here 'till I set up an add at a local website. Bumping, since I'm still looking. Any help sourcing from elsewhere on the net is also appreciated. pickups with nickle or gold poles? just looked at TRCs and I do not have the Burny ones with the wings, just a bunch of the earlier Burny, traditional 'bell' shaped ones. Also have one Greco Mint Collection TRC. I have a matched set of pickups from a 1987 RLC-60, gold poles/screws & full length leads on both. These have a 1/8" gray insulator with a bare silver wire, and a white insulator inside the larger gray insulator. Not sure what they are; anyone? VH-2? Thanks for the reply and the trouble of going through your stuff guitar hiro, unfortunately for the pickups I'm looking a nickel covered set, for an '87 RSG-75. Bummer for the TRC as well, I too only have the bell-shaped one, but I'm sure one will show up sooner or later. I wonder if these pickups from my '87 RLC-60 are the same pickups you are looking for? The gold poles/screws could be changed to nickle. I thought you didn't need the covers but it sounds like you do need the (nickle) covers, correct? If you think these are the right pickups I could help you with the poles/screws & the covers too. If you look at the last pickup pictured, near the bottom of the link, you will see a pickup with the gray insulator. This looks like the pickups that are from my '87 RLC-60. I forgot what I wrote on the ad Yes I suppose the covers are not needed as I am more tha capable of soldering on some new ones, the pole piece screws are also an easy swap. However it does look like we might not have the same pickups in mind as the neck pickup to which I'm looking for a pair on the bridge doesn't look like the one you think you have as per the japanguitars site's picture. The original neck pickup on my RSG looks more like the VH-1 pickup illustration on that site, which is a bit conflicting since I'm under the impression that the original pickups on the RSG model I have are VH-3, which according to internet pictures look a bit different again. certainly was not expecting to see a braided lead on your (1987) RSG pickup that is a surprise, to me. I wonder if that is an original pickup? It certainly is interesting and raises the question, however the pickup is rusty and grimy along with the rest of the original hardware on the guitar as expected from a 30-year old pickup. Course it could be just some overlap at the factory since, unless I'm mistaken, VH1 pickups were made to at least 'till 1986, or just a 30 year old generic replacement. personally I never really cared for much of any of the Fernandes/Burny pickups I ever had in any of the Fernandes/Burny guitars I owned. Yeah, I'm not expecting much from the original pickups either, the neck I have is nothing special really, the bridge pickup was replaced by a Gibson '57 Classic + by the seller I got it from, which is a pretty nice pickup so I'm not complaing. I'm just trying to get a complete set if I ever want to restore the guitar to it's "original" parts. I just bought two Burnys in the past 2 weeks. One late 80s SG and one Early 80s Les Paul custom. I am doing the opposite pf what you are doing. I am replacing all the pots, wiring and pickups. Also, changing out the bridges (to Faber locking ABR-1 bridges) and adding Gotoh locking tuners. Personally, I do not like the Burny PUs. They other stuff is just to make them better also. I would just get a modern set of PAFs. There are tons of companies around the world that make modern PAF type pickups that are great. I always keep the original parts for all my guitars. Pots, jacks, PU pick guards, tuners etc. 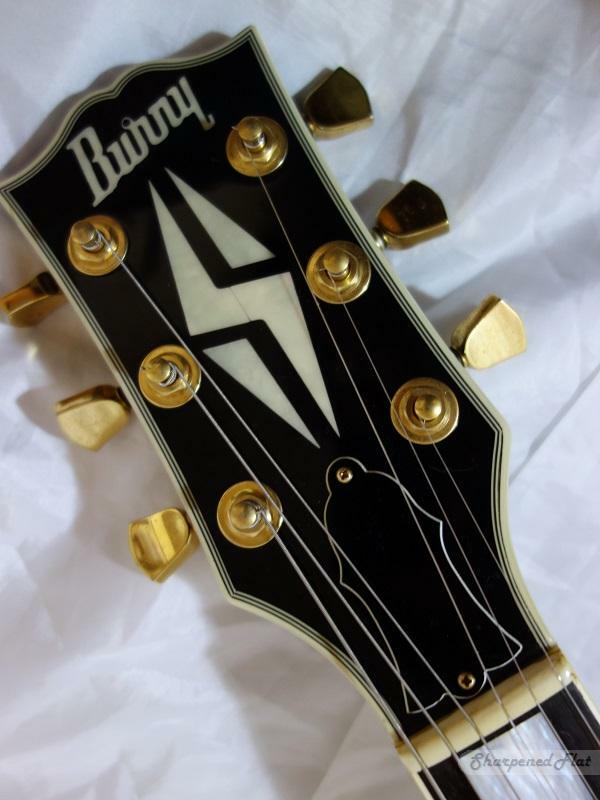 Not that the burny stuff (pickups) is worth anything just if I do decide to sell the guitar at a later time I keep all my new parts and put the old ones back in.